This section talks about crafty ideas that encompass everything and anything under the sun. This month we’re going to teach you how to make a scrapbook paper art wall. This new frontend aims to introduce our readers to some of humanity’s best architecture. In this issue, we are deconstructing the history of The Eiffel Tower. This monthly column provides home construction and home safety tips to safeguard your home and health. This month we’re providing insight on the smell of sulfur. The Kayema Xperience tackles high-end fashion topics to keep you abreast of what is in and what is not in the world of high fashion. This month we’re teaching you how to properly take care of clothes. Imparting our favorite kitchen tips and tricks to improve everyone’s skills in the kitchen, this month we are teaching you how to peel ginger. 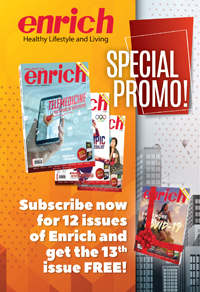 In order to maximize readership across as many demographics as possible, Enrich magazine will be featuring (incredibly popular) “facts” at the bottom of some of the pages at the frontend of the magazine. We’re upping the ante for meals gentlemen can cook with Real Eats. This month we’re teaching our readers how to make the perfect pork chop. Recess! is designed to encourage family bonding and hone young children’s intellect through Animal Facts, a Word Search, and a monthly Home Challenge. This month we will be teaching them about the Komodo Dragon. We present to you this new column to boost your constitution and enhance your cooking skills, all the while providing sumptuous meals that can be cooked and home and taken anywhere with ease. This month we’re teaching you how to make a hearty minestrone soup. Designed to inspire more home cooking and increase the culinary skills of our readers, each month we will feature what is essentially a “Spice of the Month.” This month we will teach you how to make the Mexican Mole Spice Rub. This monthly feature aims to spread awareness on contemporary gadgets and everything else tech related. This month we’re giving you something to ponder upon: dash cams.